Cohin University of Science and Technology release results for CAT examination few days ago but when I visited the site I noticed that results were posted without any secondary authentication for security. Now after seeing this I was tempted to write a script in python that could scrape student details from this site.Hence, I downloaded Live HTTP Headers plugin for firefox to see http headers going through so that I can send similar request using python in order to extract the data. 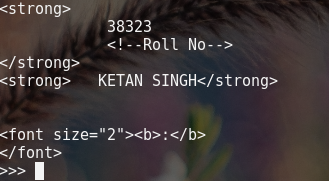 For demonstration purpose I am going to use my roll number. 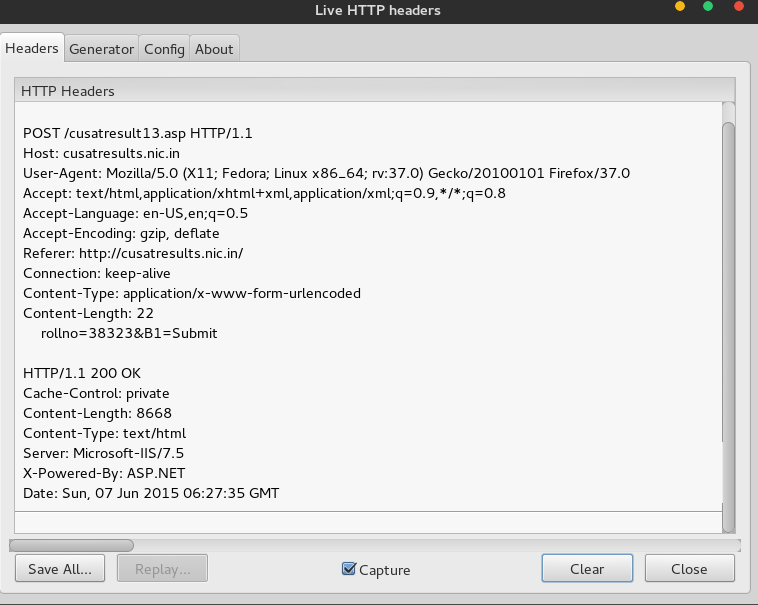 we can see that it’s sending HTTP POST request to cusatresult13.asp with parameter rollno and B1. Now let’s write python code to send that request and see if it works. Uhhh? What the hell? This is possibly because we haven’t fully “mimicked” to be browser , There is also a possibility that server is checking if request came from their server using “refer” in http headers. we need to send headers to server like the one sent by our browser , thankfully with requests we can easily do that. What a long messy header -_- huh ! Hah , Now that we can “login” into the website , our half the work is done .Moving to the actual scraping part , I am going to use BeautifulSoup to do this task , You can use us lxml too for this purpose but here I am going to stick with BeautifulSoup. On inspecting elements we see that our target data(Couse/Category and Rank) is stored within “font” tag with a specific attribute which used only for that text only. Note that I have used a variable named counter because if let loop run more than 2 times it tends to print out newline probably because site has stored data that way. Now that we’ve pulled required data , we can store data in CSV file if we like . Worst part is that roll numbers are linear hence anyone can use loop and extract data of every student that took part in examination. Unfortunately site didn’t display any other details like score in specific subjects , Which could have been useful for statistical study.